An essential guide for anyone who owns a pet, from Australia’s favourite domestic gurus. The messiest member of any household is often a pet! All that hair, all those unfortunate accidents … SPOTLESS PETS helps you solve your pet stain dilemmas and saves you oodles of money at the same time. Using inexpensive and low-toxic remedies to every pet stain imaginable, there are chapters on dogs, cats, birds, fish, small animals, exotic animals. Not only is SPOTLESS PETS packed with advice on removing stains and smells, but it covers everything from cleaning cages, tanks and bedding to removing hair from upholstery. With more than a million copies of their books sold in Australia alone, Shannon and Jennifer are the experts you will turn to time and time again when your pet makes a mess! A fabulous new book in the Spotless series, perfect for anyone who looks after babies and toddlers! Stains, spills, poo, wee, vomit. Once you have kids, there’s no avoiding mess. It’s everywhere – on every surface of your home, your baby and yourself! Here at last is the essential tool in every parent’s baby-raising arsenal – the book that tells you everything you need to know for safe, environmentally friendly and cost-effective ways to keep your babies and toddlers spotless. 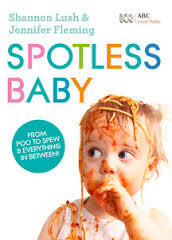 With chapters covering bathing, playtime, laundry, feeding and bedtime, Shannon Lush and Jennifer Fleming give you practical solutions on how to avoid the worst of the mess, and how to deal with it when the inevitable happens – from poo to spew and everything in between. Stainless is the must-have new book from publishing phenomenon Shannon Lush. know what to do if you stuff it up! In a clear and conversational style, Shannon explains the uses for each of the items in your essential cleaning kit, and shares loads of her tried-and-true grime-fighting formulas. Stainless is absolutely packed full of information that will help you clean anything and everything in your home, without resorting to expensive sprays and solutions from the supermarket. There are even recipes for making your own inexpensive cosmetics, dyes, insecticides, fertilisers and more! Kids CAN clean with Shannon Lush, every parent’s best friend. It’s true – cleaning can be fun! Ever wondered how to get those stains out of your clothes before Mum gets home? What can you do about the squashed banana at the bottom of your schoolbag (the one that’s been there for a couple of weeks)? And how can you clean up your bedroom without spoiling your weekend? From personal hygiene tips (why you should take your finger out of your nose), to ideas for speed cleaning your bedroom, to fun things to make, Shannon Lush and her daughter, Erin, have it covered. Kids can clean, and with Shannon and Erin, you’ll even enjoy it! Shannon Lush is at long last bringing her incredible knowledge, unrivalled skills and eco friendly cleaning techniques to the small screen. Each episode, one household receives the Shannon Lush treatment. These are people that need her help to get their homes and lives in order. Her simple, non-toxic approach to cleaning and household management will enable viewers to discover everything they ever wanted to know about domestic disasters. Do any of these daily domestic disasters sound familiar? 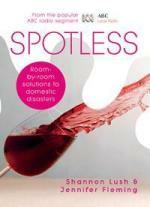 These problems and hundreds more are answered in Spotless, the first book by ABC local radio’s domestic guru Shannon Lush. 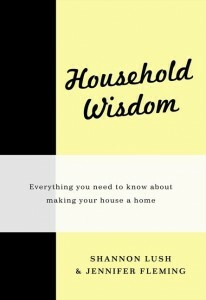 even at this essential home handbook she shares the vast wealth of domestic wisdom, tips and techniques that has ABC listeners jamming the switchboard with their questions when she is on the radio. Together with her co-writer Jennifer Fleming, Shannon presents a brilliant room by room problem solver to the stains, smells and scratches that are sent to try us all. 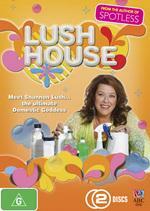 Australia’s favourite domestic gurus are back! Following on from the phenomenal success of Spotless comes this ultimate guide to dealing with common domestic disasters. Taking you through your home room by room, Spotless 2 provides simple and environmentally friendly solutions to hundreds of new stains, smells and scratches. 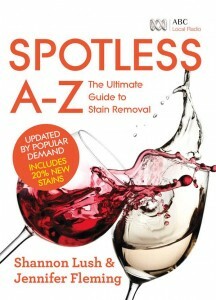 It answers the real-life questions of readers and ABC Radio listeners, and includes many updated stain-removal techniques. There’s also a brand new chapter devoted to clothing and shoes, and a super-comprehensive guide to removing carpet stains. Spotless was the original problem-solver. 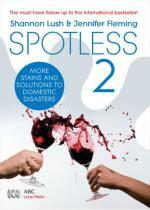 Spotless 2 is the grimefighting follow up no home should be without. The long-awaited new book from the authors of the blockbuster bestseller Spotless. 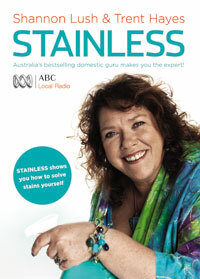 It’s almost a decade since the original Spotless took Australia by storm, selling more than half a million copies and launching Shannon Lush as Australia’s most trusted domestic guru. Now the original team of Shannon Lush and Jennifer Fleming has written the book that everyone has been asking them for – an A-Z of stains and stain removal that will become the new trusted household companion. Shannon’s tried and true remedies have rescued many an accidental stain maker, and now solutions are even easier to find in this A-Z guide. Not only that, it features brand new stains – from pesto to pomegranate, kebabs to kiwi fruit, hoisin sauce to hummus – as well as old favourites – from red wine to rust, banana to butter, moths to mayonnaise. Spotless A-Z features a comprehensive list of stains, the most common surfaces affected by stains, and step-by-step instructions on how to solve them. there’s no need to consult an index. the solutions are right there – and they are solutions you can trust. With so much information about stain removal techniques available from so many different sources, much of it contradictory, it’s important to have a guide you can rely on: Spotless A-Z. A practical guide to turning a house into a home, from the authors of SPOTLESS and SPEEDCLEANING. What makes a house a home? What turns it from bricks and mortar into a place you can’t wait to get back to? How do you create a welcoming and comfortable environment? 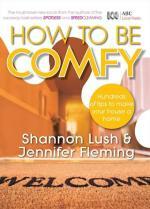 In HOW TO BE COMFY, Shannon Lush and Jen Fleming will show you how. there’s not much point to a gorgeous-looking but impractical house. Shannon and Jen offer tips on creating cosiness as well as advice on how to choose household goods, how to look after them and how to fix them. Just some of things you’ll learn about are how to fix a flyscreen, stitch a hem, replace a tile, select and store fruit and vegetables, and change a washer in your toilet cistern. HOW TO BE COMFY is your perfect guide and companion to making your house the place you want to come home to. With SPOTLESS, Shannon and Jen have made cleaning easy and foolproof and, now, with their new book SPEEDCLEANING – they make it fast. So you want to ditch the dust in record time? Blitz the bathroom before guests arrive? Flat out and on the go. the last thing you want to do after a hectic day (or on the weekend) is cleaning the house. But help is at hand! 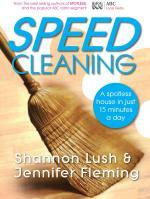 the undisputed Domestic Guru, Shannon Lush, and Jennifer Fleming have written SPEEDCLEANING for everyone who wants a clean house but doesn’t have much time. All you need is 15 minutes a day and the sure-fire systems and cunning methods explained in SPEEDCLEANING . Filled with brilliant practical advice, non-toxic cleaning methods and good old-fashioned common sense, SPEEDCLEANING will show you how to clean your house, top to bottom, room by room (and outside) as well as providing excellent advice on Spring and Autumn Cleaning, Organisational Dos and Don’ts – and of course more tips on stain removal! SPEEDCLEANING – the ultimate guide to avoiding domestic drudgery. 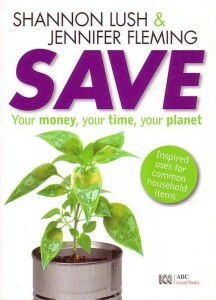 SAVE is full of clever ideas to help you get the most from everyday household items. In the process you’ll save money, save time and save the planet! these days, once we’ve finished with something, we tend to throw it away rather than consider if it has another use. In SAVE you’ll find out how to turn a lampshade into a wastepaper bin, create a mosaic from broken crockery, and make lip gloss from the last bit of your favourite lipstick. Learn how to revamp your tired-looking couch, how to tenderise meat using paw paw pips, and what to do with old ladders. There are tips on how to get the very last bit out of bottles and the many uses for old corks. Read advice on how to be a smart shopper, and find out how to make a leg of lamb last all week! You’ll rediscover the lost arts of frugality and invention and have fun in the process. SAVE takes you through your house room-by-room with a raft of ideas for finding an uncommon use for things you commonly use. Remove the burden of living on a tight budget. Find out how to spend your time creating rather than consuming. And help the planet in the process. A room-by-room guide full of affordable, practical and inspirational ideas to suit every budget. HOUSEHOLD WISDOM harks back to a thrifty and resourceful not-so-distant past. A time when items were reused rather than discarded, there was less packaging, more composting and a spirit of make-do and mend. A bumper edition of HOW TO BE COMFY and SAVE – two bestselling titles from Shannon Lush and Jennifer Fleming – this book is packed with clever ideas that will help you make your house a home with personality. You will be inspired to hunt through second-hand stores, think twice before throwing something out, save on your bills, make the most of the space you have, and cook nourishing, cost-effective meals. With plenty of Shannon and Jennifer’s trademark room-by-room tips for solving stains and repairing things around the house, this a book that no homemaker should be without. 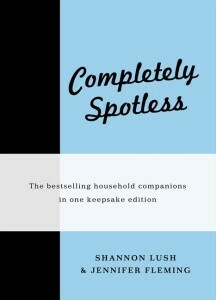 Bestselling household companions SPOTLESS and SPOTLESS 2 in one gorgeous keepsake edition When it was published in 2005, SPOTLESS immediately became a massive bestseller, and the success continued with SPOtLESS 2. Packed with advice and solutions to stains, cleaning and household problems for every room in your house, these books were embraced by hundreds and thousands of readers all over Australia. Now, for the first time, both these classic household companions are available in one beautiful hardback edition. this handsome book will see you through many a domestic crisis, and its durable format means that it will become a treasured family reference.